As you can guess this is a short anthology featuring all the Doctors Titan Comics currently publishes for, which means no classic Doctors, just the ones from the new show. While I don’t mind spoiling a Free Comic Book Day comic these are short adventures so it would be hard not to. The Twelve Doctor, sans Clara which I can only guess about because I lost access to BBC America even if I wasn’t preoccupied, is contacted by Professor Osgood of UNIT because K2, the successor to K1 (not to be confused with K9 by the way–totally different robot), which the Doctor took out in his first adventure in the fourth body–Time Lords are confusing–is apparently no better than his daddy and goes on a rampage because somehow working with living metal also meant building a new robot with the same AI or something. Sadly this is one of the 4th’s episodes I’ve also missed. How does the Doctor stop him?? One shot of the Sonic Screwdriver, while the Doctor has to be saved by Osgood because the Doctor was in the robot’s hand when he disassembled it. I can see why the Sonic Screwdriver gets the reputation it does as a “do anything” magic wand. That’s kind of a weak ending, which I blame on the allotted space and we’ll probably see again. I remember being told that IDW couldn’t get the license to use Abslom Daak, a character that I shouldn’t like given my tastes but for some reason I really do. He’s like mixing Han Solo with the Punisher, only more violent, which he soon turned to hunting Daleks. 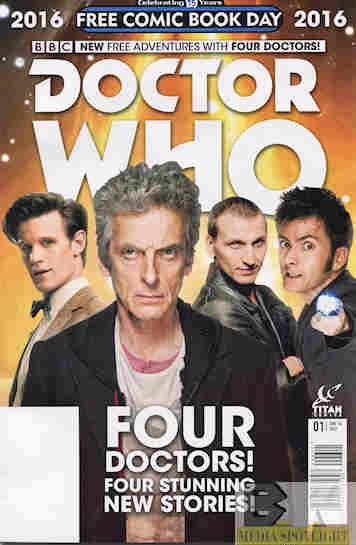 We’ll be meeting him again in “Yesterday’s” Comic when the Doctor Who comics I haven’t reviewed come up again. And yet Titan somehow gets to use him. Well, I’m just glad to see him again. He is travelling with an original Companion, Abbie Obiefune. The only reason Abslom is here is because the TARDIS took his wife (actually they weren’t married because she died too soon, but someone at Titan apparently forgot that or there’s a story I’m missing from the original run) for some reason and he plans to find her. He kind of does but thanks to the Doctor accidentally sitting on the intercom switch (yeah, right, “accidentally”) Dakk hears the Doctor talking about how obsession can hurt you. So he “didn’t find her” and he’s hanging with the TARDIS a while longer. There are some parallels between Daak and the Doctor, specifically the 9th (and possibly the War) Doctor, in an obsessive hatred of Daleks. It’s a good character piece. The 10th Doctor also gets original Companions, Gabby Gonzales and Cindy Wu. Cindy isn’t really used to the TARDIS in this story so she’s sure a ghost is messing with her stuff although the Doctor and Gabby just says the TARDIS made her bed. Gabby gives Cindy a tour of the TARDIS while Cindy keeps an eye out for her “ghost” but only finds some dimensional gate between the wardrobe and the console room, the result of the Doctor working on a new device. Oh, and he accidentally deleted Cindy’s room. Not here day, is it? It’s a good discussion of the TARDIS and the oddities in how it works. I liked it. Overall, a pretty fair group of stories. Not having read any of the Titan run I can’t judge how well this represents the multiple comics (each new series Doctor has his own comic) but the stories were all pretty good. Maybe if I have income again I’ll check it out. Posted by ShadowWing Tronix on September 3, 2016 in Television Spotlight, Today's Comic and tagged Doctor Who, Eleventh Doctor, Free Comic Book Day, Ninth Doctor, Peter Capaldi, TARDIS, Tenth Doctor, Time Lord, Titan Comics, Twelfth Doctor. I can let you borrow “The Robot” DVD if you’re interested. It was an excellent Tom Baker story. Who’s your favorite Doctor and why? That’s interesting. Yes, I liked the 5th Doctor, but my favorite Doctor will always be the 4th: Tom Baker. This is probably because he was the first Doctor I got to know. The first time I watched Doctor Who in 1985, it was Tom Baker who I saw. Plus, I liked his eccentric, quirky nature.